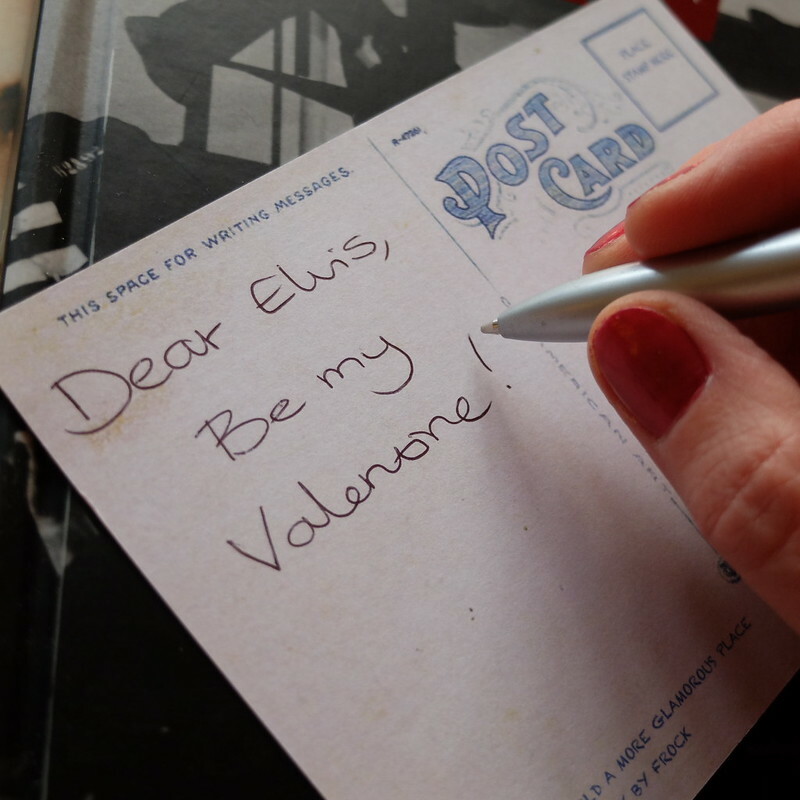 It may be three weeks until Valentine's Day, but here in Wales, we celebrate love a little earlier in the year. St Dwynwen's Day is Welsh Valentine's Day, and falls each year on 25th January (the same day as another regional celebration - Scotland's Burns Night). Needing no excuse to dress up, what better way to mark the occasion than with one of the glamorous bed jacket and French knicker sets from Glitter and the Moon? The antidote to tacky Valentine's lingerie! 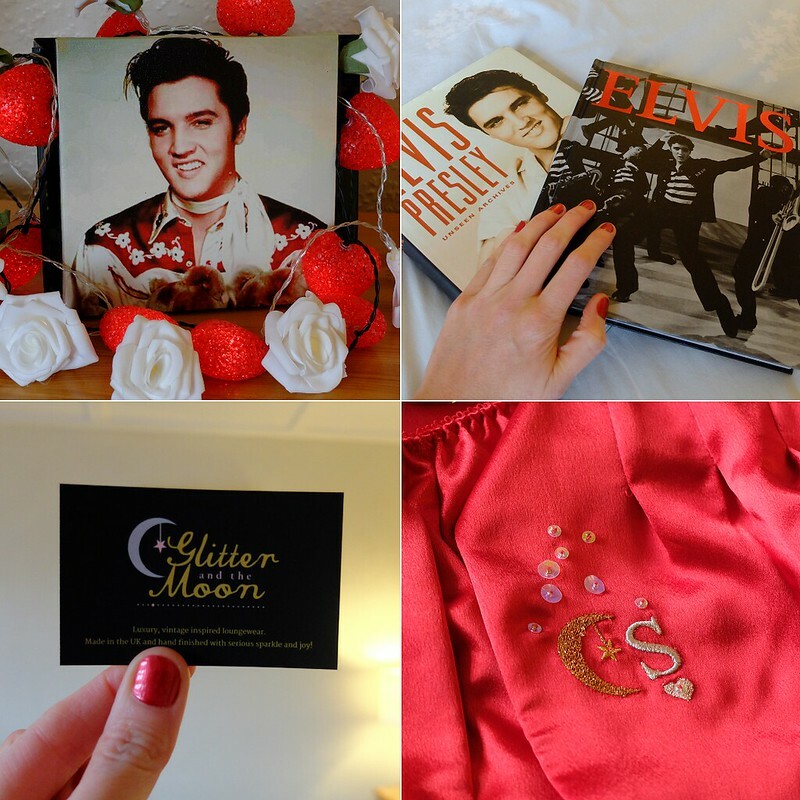 This is also an opportunity to share some of the somewhat extensive collection of Elvis memorabilia that exists in my household. 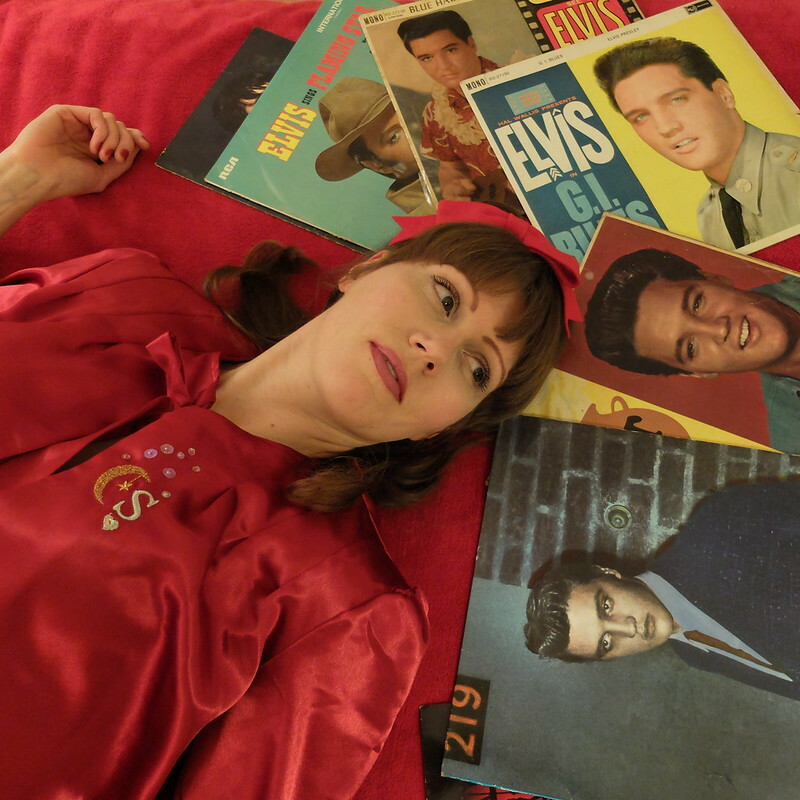 I wasn't a huge Elvis fan until the first roadtrip I took with my now husband across Tennessee when we'd been seeing each other for six months or so. On the first night of our trip we stayed in the Heartbreak Hotel watching back to back Elvis films, and of course visited Graceland the next day. 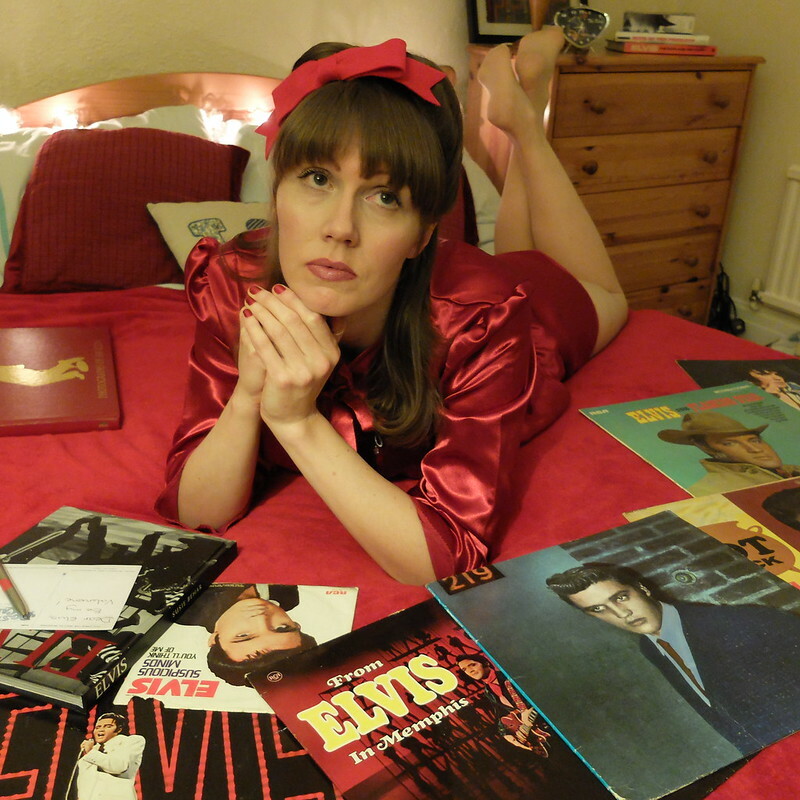 I fell head over heels with The King - and my husband! As I am posting with Valentine's Day in mind, I'll just mention my husband's reaction to this ensemble; 'cute'! I have to say I'm not one for raunchy and skimpy lingerie, and so it's rather refreshing to have a lovely vintage style set like this that leaves a bit more to the imagination. It made me feel very glamorous, and it's a bonus that it's comfortable. Feeling awkward dampens ardour like nothing else. The quality of the jacket and knicker set is excellent, in such a gloriously rich red, and you'll notice that it's personalised too. I didn't choose a 'P' for Porcelina, instead choosing to have my personalisation for my real name. Glitter and the Moon personalise items with your monogrammed initial for no extra charge. The detail is really lovely, with the 'Moonlight' design I chose showing a little crescent moon with hanging star, but there are many other themes to choose from, including cocktails, roses, beauty salon and snowglobe cities. Bed jackets start at £55, French knickers at £25, and robes at £110, with all three available in ivory, red or black. 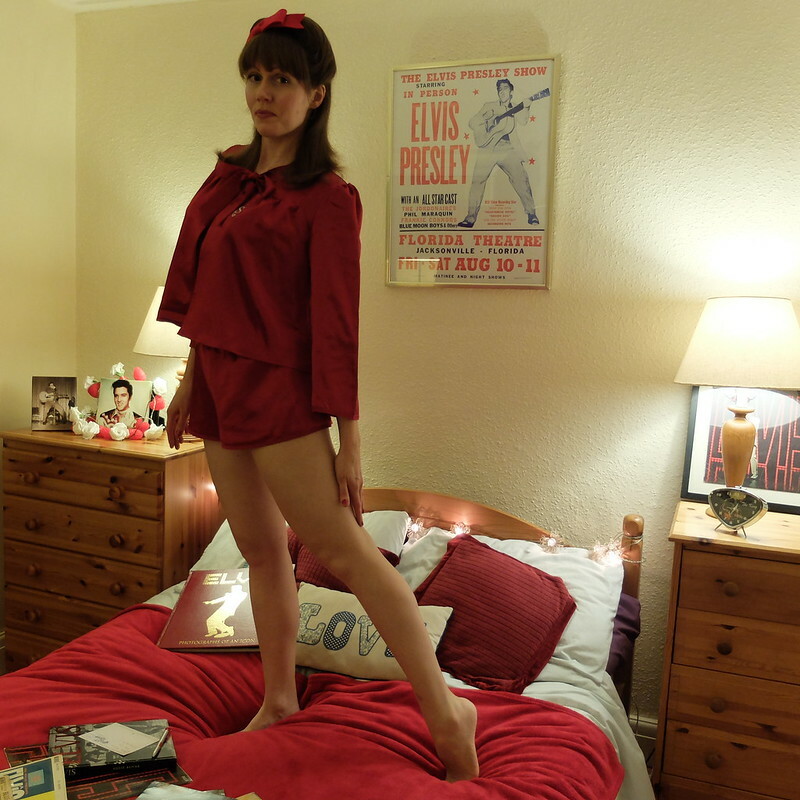 There's a great offer on at Glitter and The Moon presently - order a bed jacket by Valentine's Day, and you'll be sent a matching French knicker for free, saving you enough to buy some champagne! 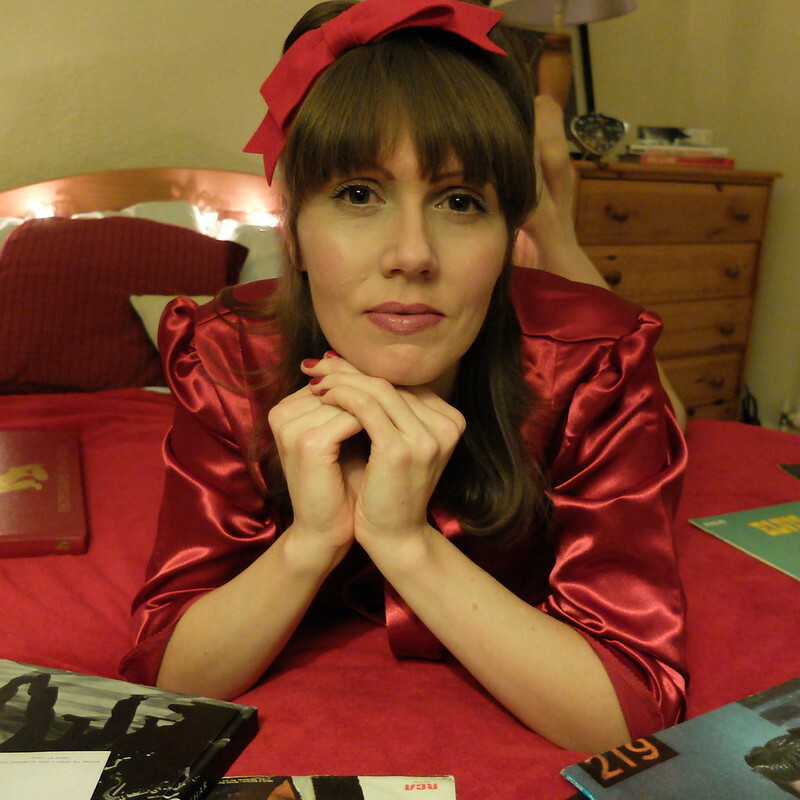 I was kindly sent the bedjacket and knickers for review. Words and opinions are all my own. Oh, that's a pretty set! The monogram is a beautiful touch. I'm now intrigued to know about your road trip - it must have been amazing. Absolutely. I don't understand what modern young ladies see in boy bands!! What a great photoshoot! The work you put into this really shows. The personalization really makes the ensemble special. 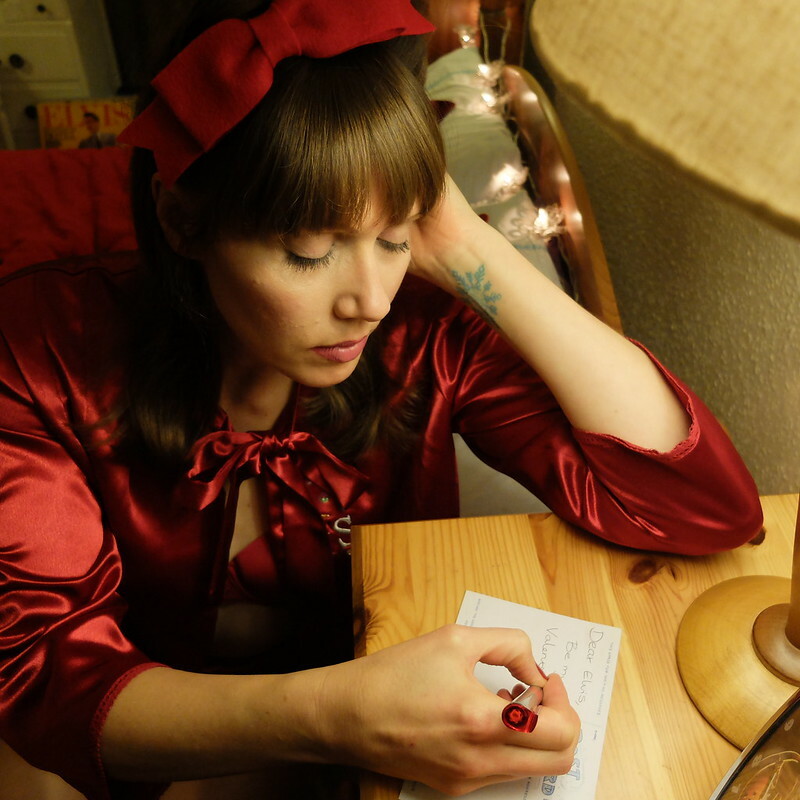 This is such an awesome post and what gorgeous garments :) this whole setting reminds me of a scene in Grease when Marty is writing to her pen pals! Wow, i'm showing my age! That is an impressive Elivs collection! You look beautiful in this luxurious scarlet ensemble. I actually had no idea there were vintage reproduction companies that made bed jackets and sleep wear - especially such elegant and modest ones. Perfect for Valentines Day! I love the bed jacket so much!! Classic elegance at its best!!! You like super cute! Your pajama set is gorgeous. 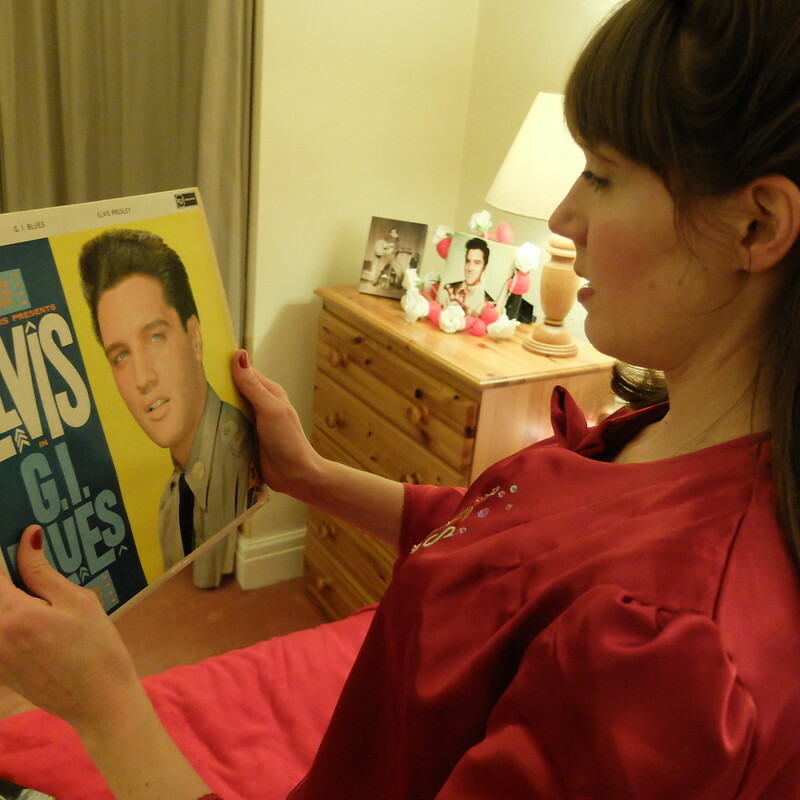 So nice to hear that someone from a younger generation has a love of Elvis. I have been a huge fan since childhood. My dad took me to see him LIVE when I was about 15 yrs old. The electricity he generated in that arena is nothing like I've ever felt before or since. It was an experience of a lifetime that I will never forget. Happy St Dwynwen's Day! Such a cute set! And I love your photoshoot! How cute are you! That hair, and the little bow, are so perfect with this pretty set. I agree that being comfortable, as well as cute, is definitely important when you're getting busy, and I think this is the sort of thing that would do the job admirably. I don't usually spend a lot of money on lingere or pajamas, but this is the sort of thing that makes me want to. What a gorgeous series of photos and bedroom ensemble. The whole vibe here is just so fun, romantic and cool! Great photoshoot, it reminded me a little of that scene from Grease too. Looks like a lovely set and if it is comfy too that is perfect! 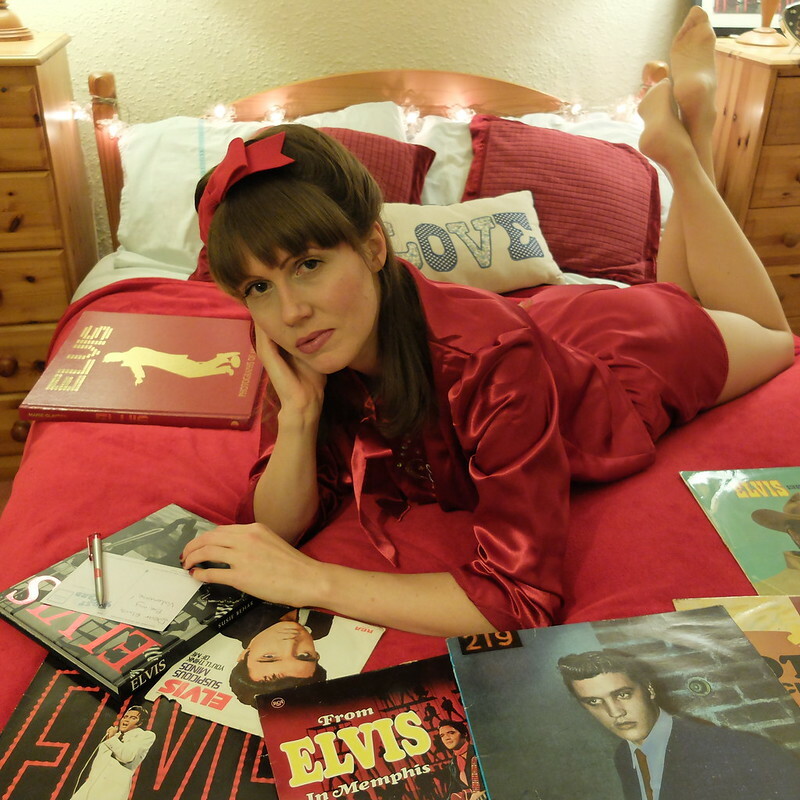 What a great pajama set and love your Elvis collection!